One of my great passions in life is learning foreign languages. 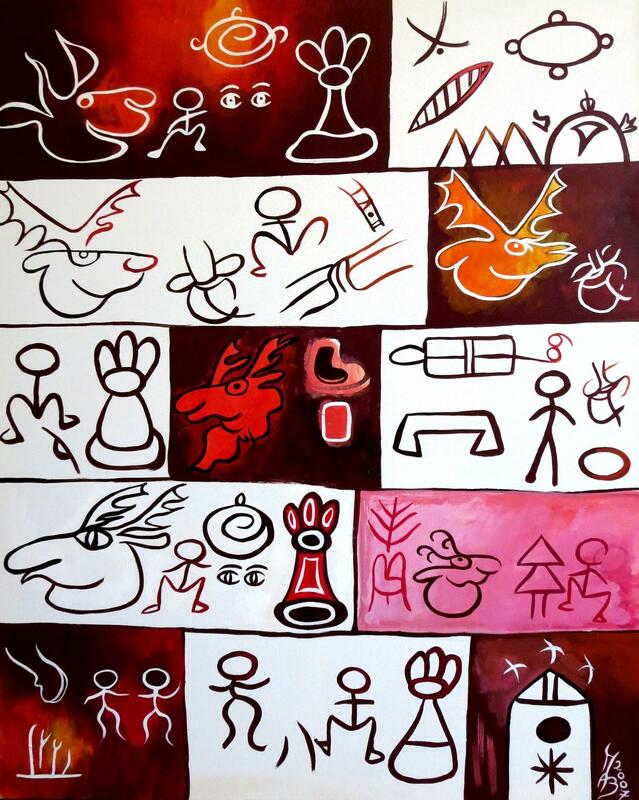 The paintings on this page explore aspects and dimensions of world languages and they pose the question :"What makes a language?!" and also: "How do language work?" What can they convey and not? 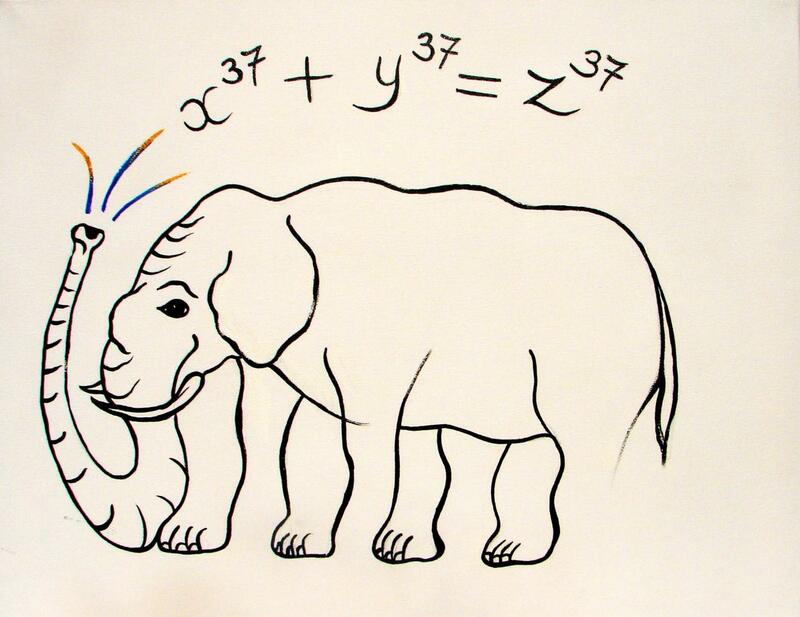 Is mathematics a language? 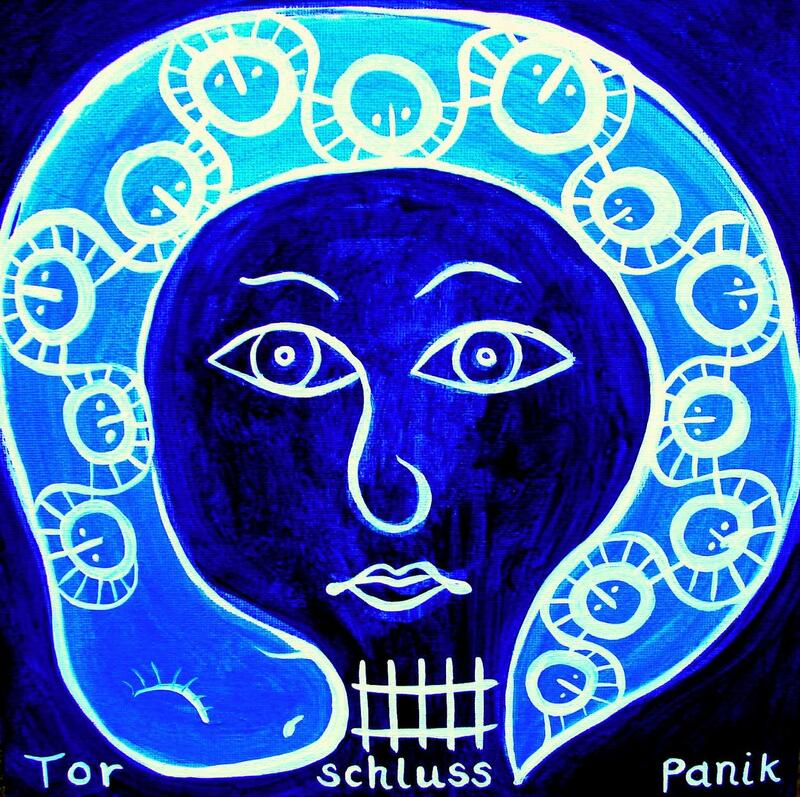 Is music a language? Exists of the character for woman (on the left) combined with the character for child (on the right). The characters used to write Japanese (except the additional phonetic scripts of the hiragana and katagana) are derived from ancient Chinese characters. 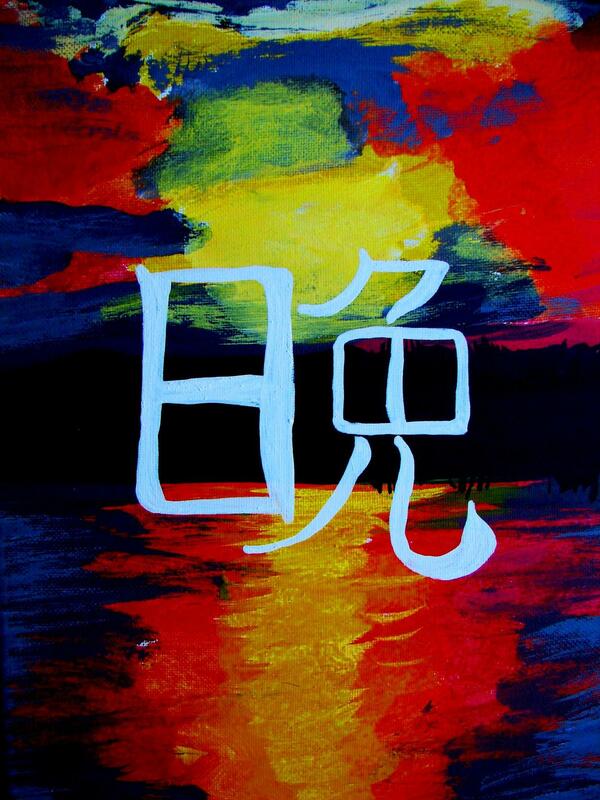 (In Mandarin Chinese this word is pronounced HAO and means "good or well'. A woman and her child together means 'all is well in the world", all is in order! "NI HAO MA?" - How are you? 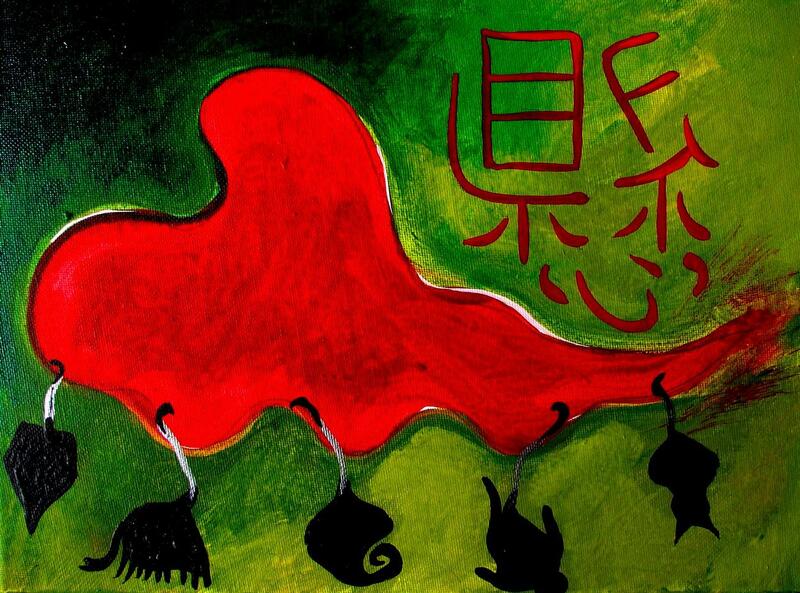 "HEN HAO XIE XIE NI" - Very well, thank you! NI HAO (on its own) means simply: "Hello! (Wo)man has always spoken different languages. In the 19th century people believed in the concept of Man's Original Language. They analysed contemporary languages of isolated so called 'primitive peoples'. No Fossil Language was found, just a myriad of different languages. 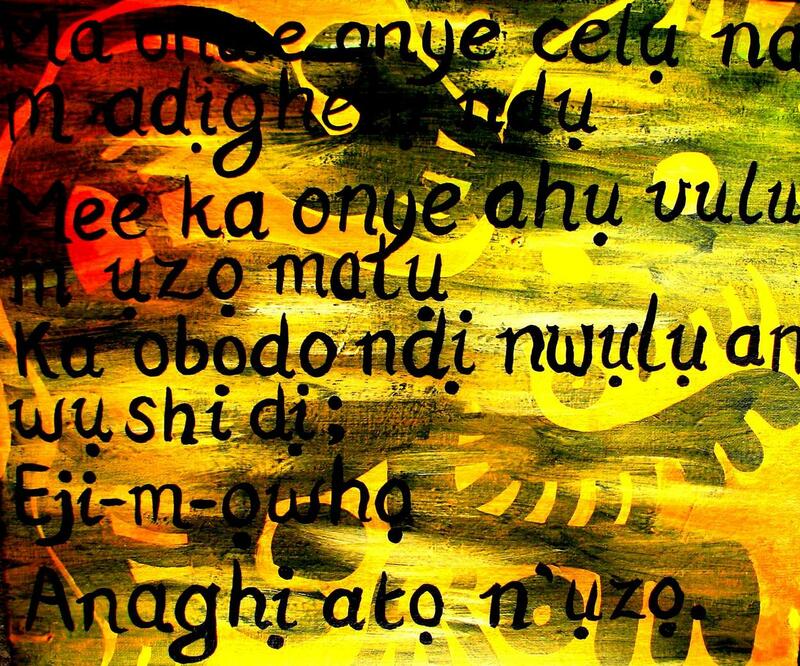 Nigeria alone has 250 languages! (Though the main two languages are Yoruba and Ibo or Igbo). Yoruba was the language of the great Oyo empire of Nigeria. The Yoruba alphabet was largely the creation of Samuel Crowther, a freed Yoruba slave, who later became a Christian missionary. The grave and acute accents (which I can't produce on this computer!) indicate the rise and fall of the voice. 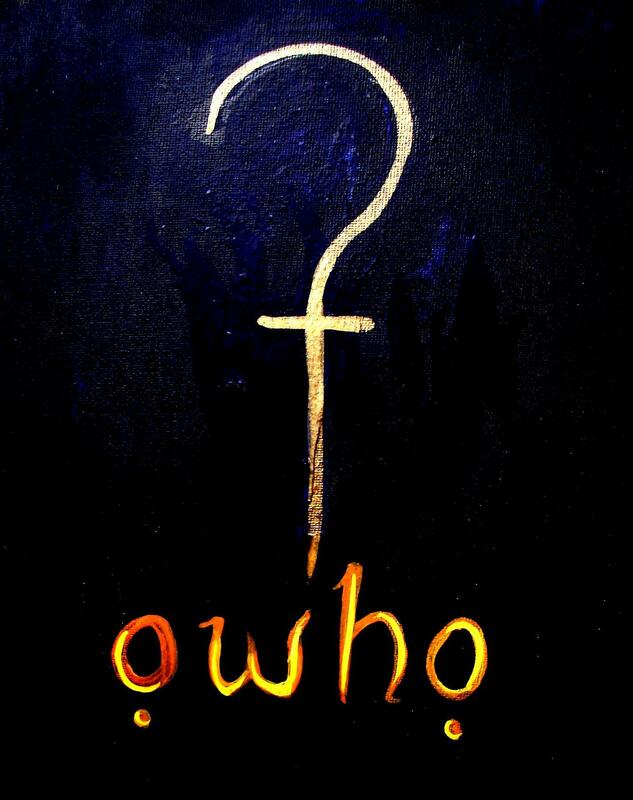 These lines and the concept of 'OWHO' are from a prayer to God and the Ancestors. The 'ohwo' is a sacred staff which symbolises righteousness. In the prayer the man who holds on to his 'owho', on his journey to the land of the dead, will not get lost! In Yorubaland (the area of central Africa where Yoruba is spoken) names given to children reflect the circumstances of their birth or the wishes parents harbour for a particular child. All names have a special meaning. Examples of this are: Babatunde (the father has come back) - for a boy born soon after the death of his grandfather or Yetunde (for a girl born after the death of her grandmother. Other examples are: Oluwabanke (The Lord helps me care for her) or Olayinka (wealth surrounds me). 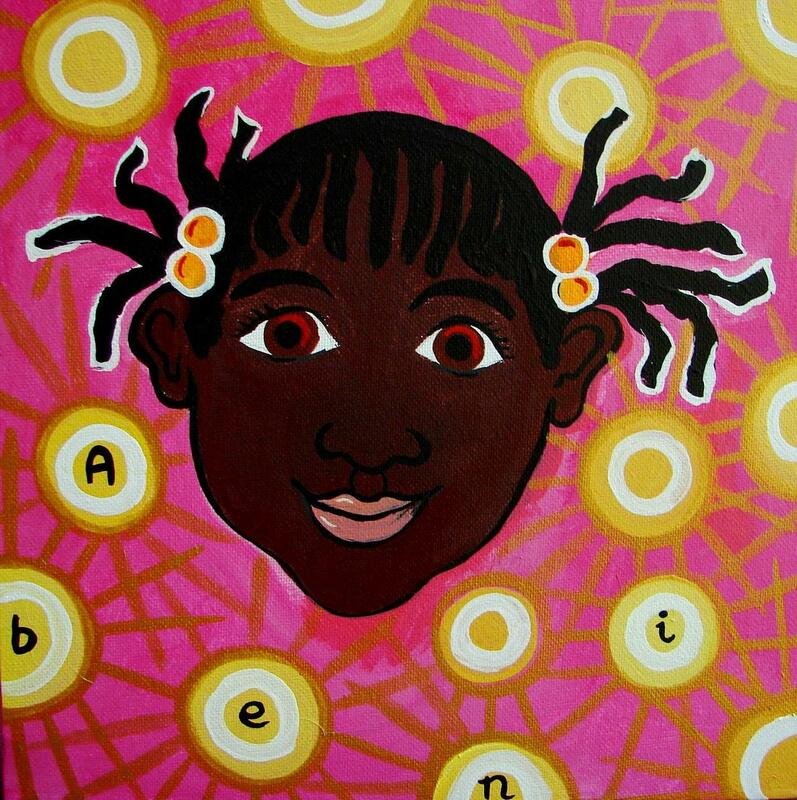 The girl's name Abeni means: we asked for a girl and behold, we got her! The single island of New Guinea numbers a mind boggling 700 languages (approximately)! Batak is an Indonesian language that is spoken on Sumatra. 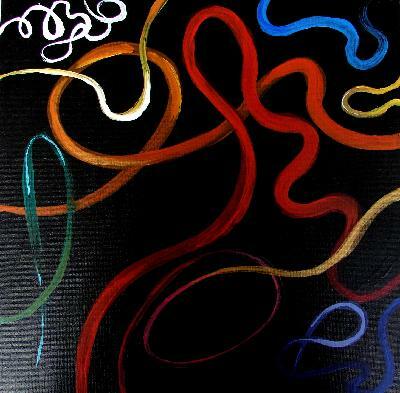 It looks very rhythmic, almost like music! The distinctive alphabet is rapidly disappearing in favour of the Roman alphabet and today only very few people can read and write the script. Languages are like plants or animals in that they can become extinct. The advent of mass communication has accelerated this in recent decades. For instance: I am Dutch and my mother tongue is Dutch, but English has become like an unofficial second mother tongue to young people in the Netherlands. They watch English pop videos and sing along to English songs from a very young age. We Dutch people need to make sure that we preserve our language and cultural heritage for future generations. 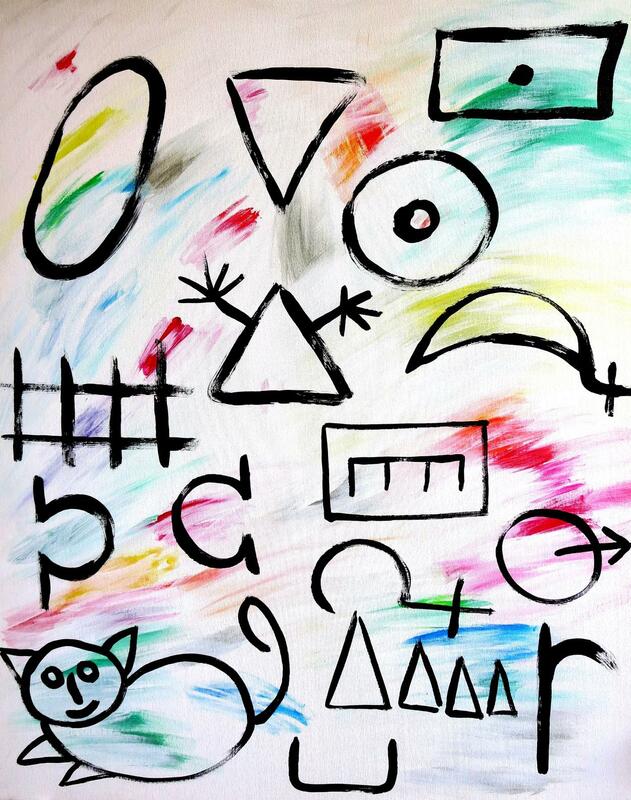 So this painting is about Dutch, my native language! 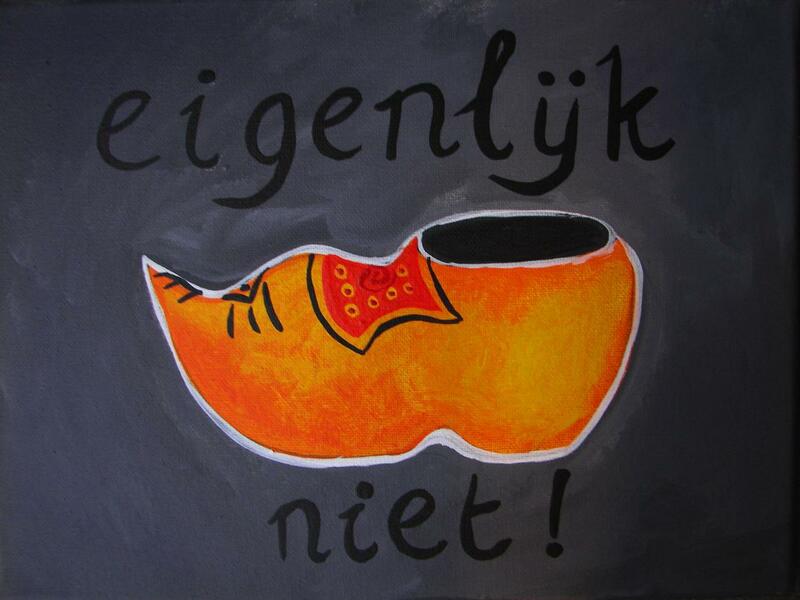 'Klompen' or wooden shoes are are an icon for Holland. However, I never wear them and most people in Holland don't often wear them either these days. Therefore the title of this painting is 'Eigenlijk niet' or 'Actually not!'. These words show the letter combinations 'ij', 'ei' and 'ie' typical for the Dutch language. 'IJ' is a unique sound that has no equivalent in English. 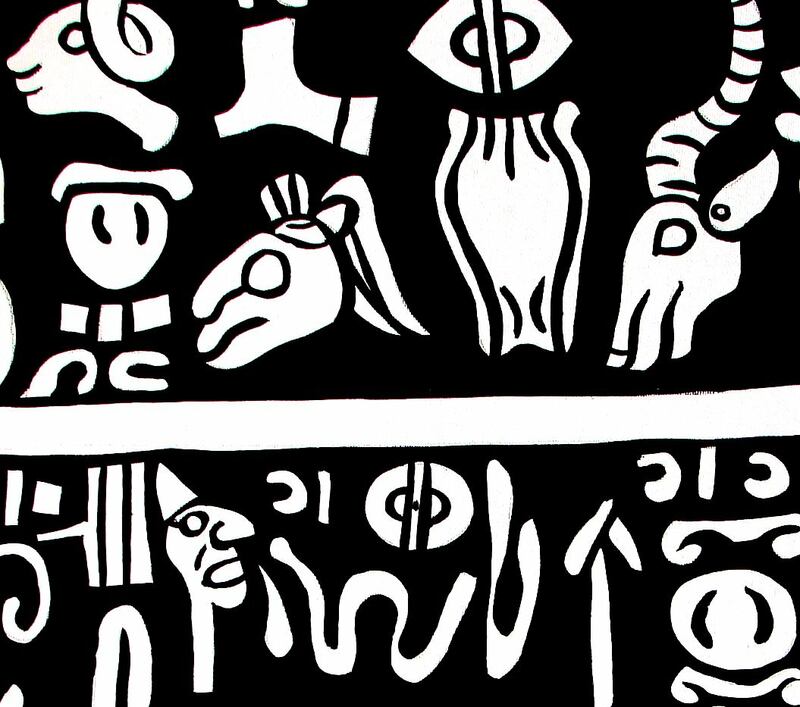 (Above right) This painting is based on a Hittite inscription from Carchemish. 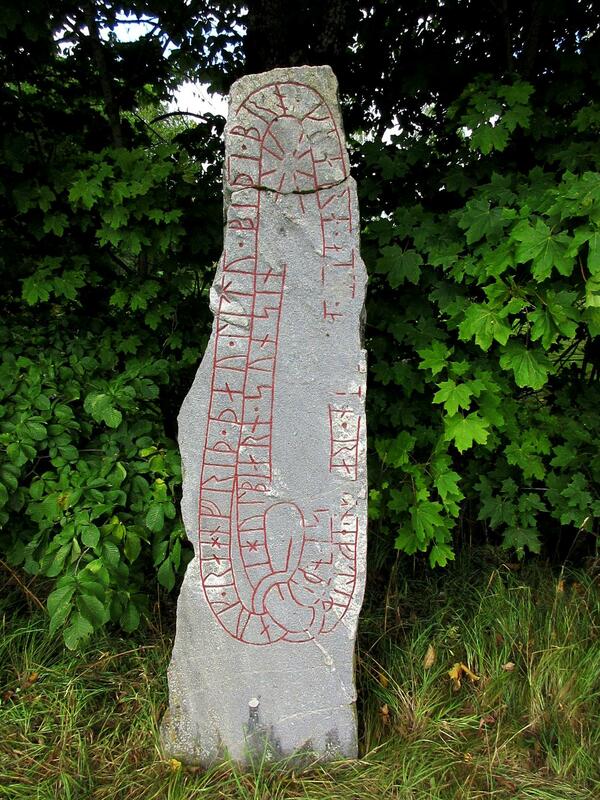 The name of the town is located around its logogram as is the name of the storm god Tarhuns. The Hittite were a non-Semitic people. The Hittites settled in Asia Minor towards the beginning of the 3rd milennium BC and eventually created an empire which embraced much of the Middle East. They had a large pantheon, because their religion absorbed the cults and gods of other peoples. 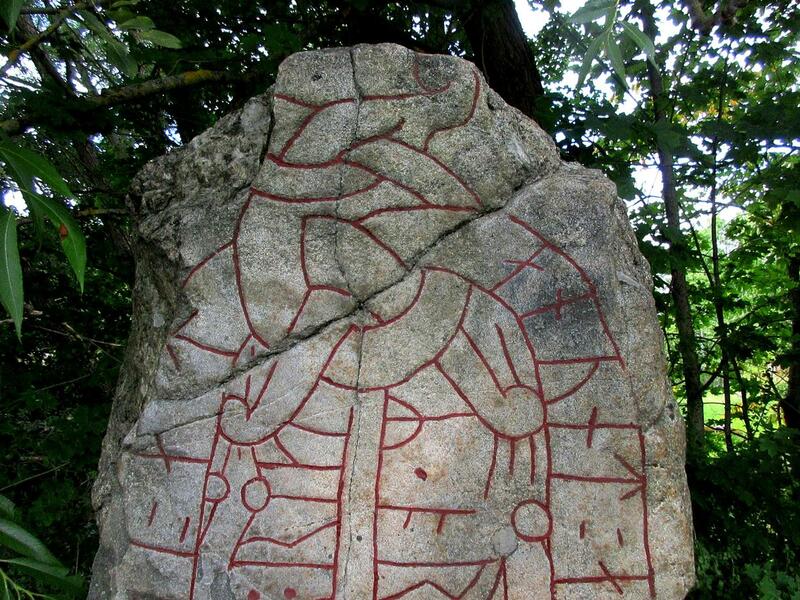 Hittite myths basically divided into two categories: the slaying of the dragon and the missing god! Alexander von Humboldt, a Prussian naturalist and explorer went on an expedition to South America that lasted five years. 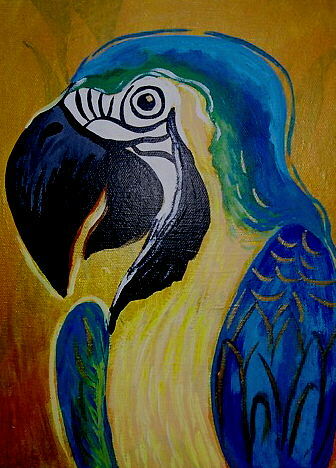 In the Amazon region in Brasil he visited a village where the local people told him of a parrot that spoke a language they couldn't understand. Humboldt recorded the 40 words the parrot used and discovered it was a language that used to be spoken by the extinct tribe of the Atures! In 1997 I worked as a volunteer in a field hospital in Bangladesh. The Indo-European family of languages is the world's largest. It embraces the languages of Europe, America and much of Asia. 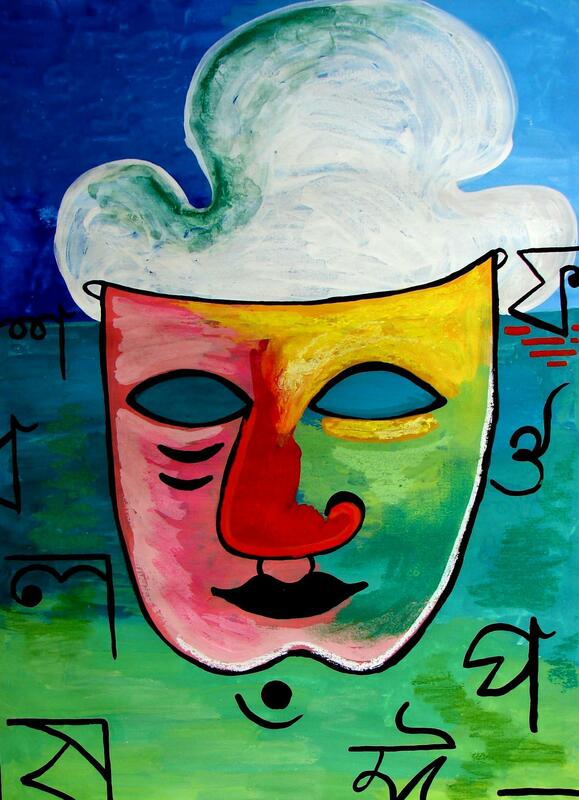 It might not appear so at first sight, but languages like Sanskrit or Bengali are related to the European languages! A few comments about writing and scripts next. When you think about it, writing is a pretty amazing concept. We are so used to having a way of writing down our spoken language that we take it for granted! However, some would say that writing is the greatest invention of human history. In fact, writing made it possible for the subject History to exist! 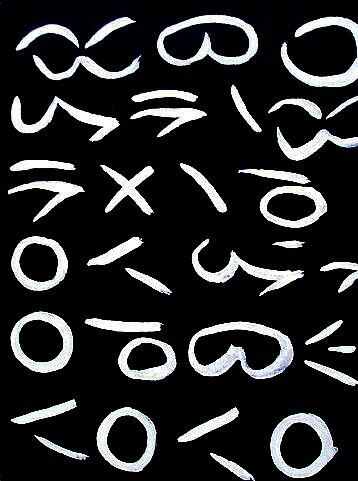 To see just how miraculous an invention writing is, let's forget about our own script for a moment and look at Rongorongo, a script from Rapanui (Easter Island). 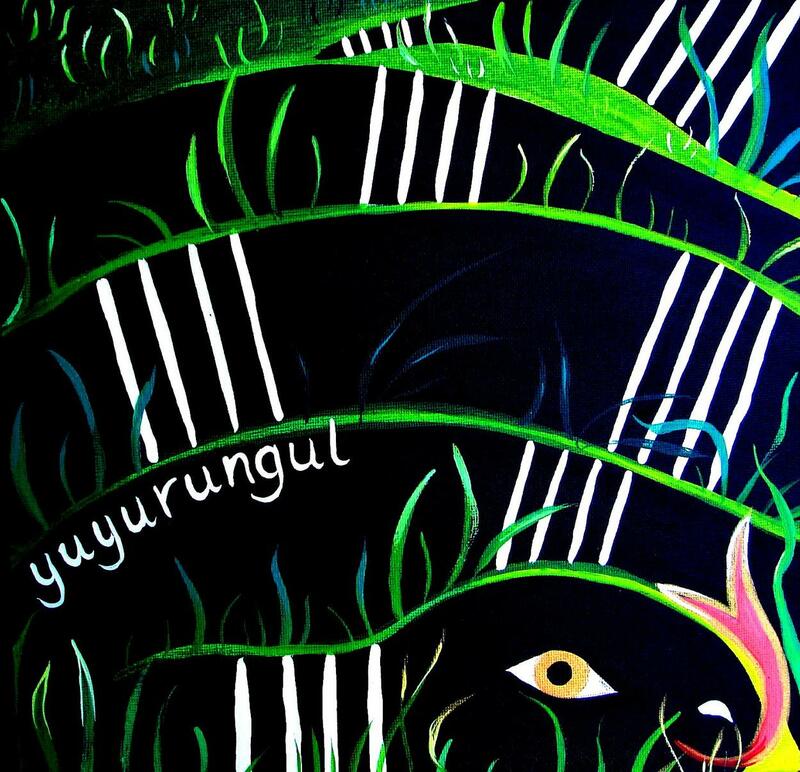 No one has managed to decipher Rongorongo so far. It looks beautiful and mysterious, but no one alive today can read it! 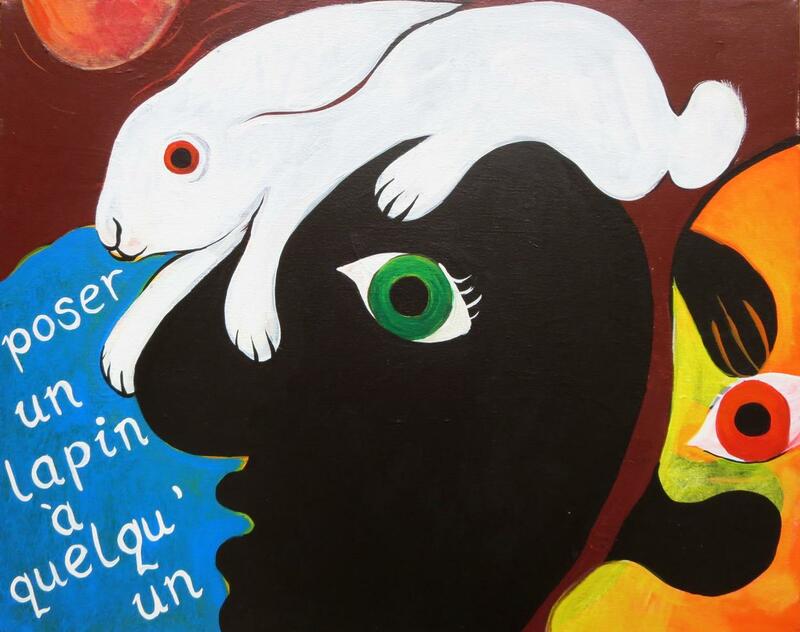 Here is another powerful illustration of the fact that languages can become extinct (think again of Humboldt's Parrot!) The one thing we do know is that the word rongorongo itself means chants or recitations. 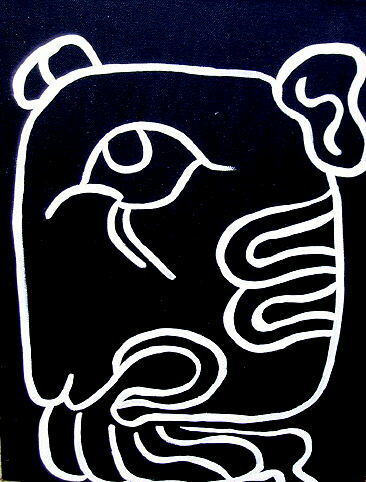 'All scripts that are full writing are a system of graphic symbols that can be used to convey any and all thought'. Using this definition the language of mathematics (or music, or computer programming) isn't a full language. If you look at a book about Mathematics (during presentations I show a book by Robert Kaplan, ('The Art of the Infinite. The Pleasures of Mathematics'), you will see that mathematics requires sentences to explain the flow of argument and link the algabraic formulas together. Without those sentences the formulae mean nothing. You have to start off by explaining what 'x', 'y' or 'z' stand for. Writing and reading are intrinsically bound to speech, whether or not we move our lips! Writing and literacy are mostly seen as a good thing. However, it must be acknowledged that there is a dark side to writing: writing can also be used to deceive or trick people, to falsify history or to blackmail people! In terms of today's world you can think of the paparazzi hounding celebrities. WHY DID PEOPLE START WRITING? Human beings have always felt a craving for immortality. Inscriptions on graves are among the earliest examples of writing. 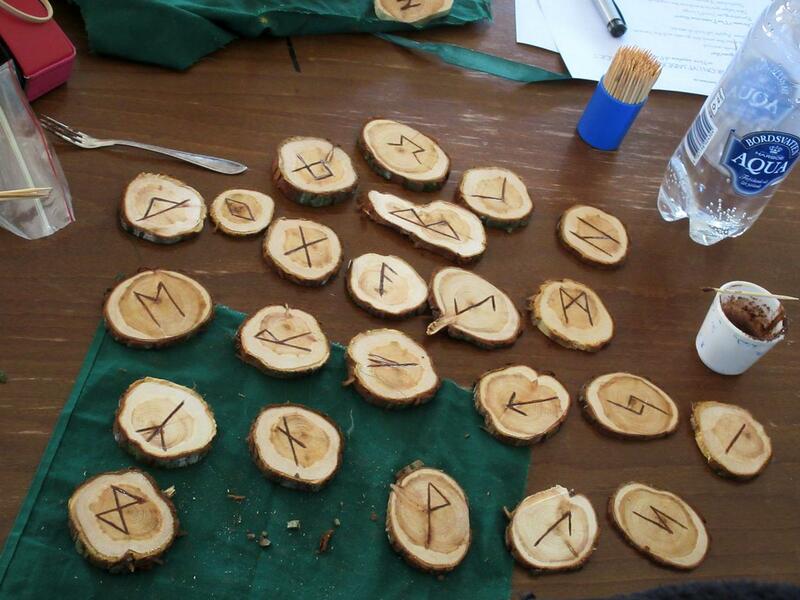 A very early form of writing in Europe are the runic signs. 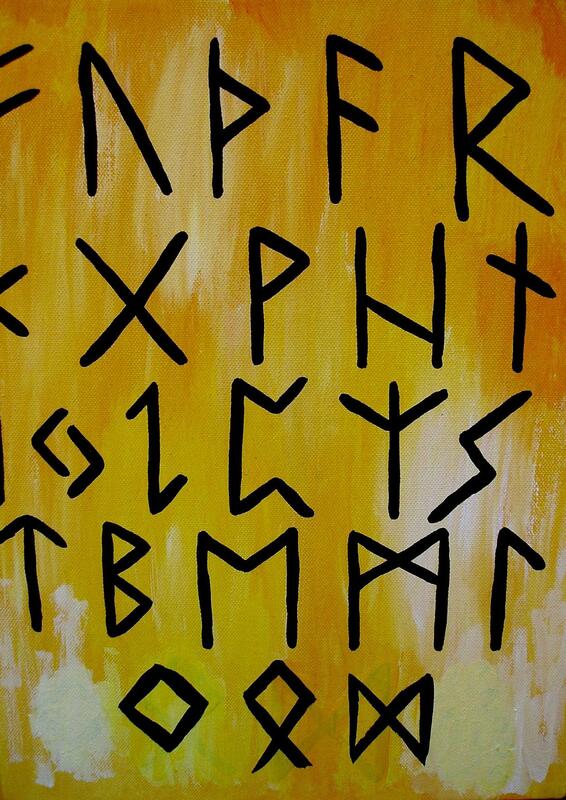 The Runic alphabet is known as the Futhark for its first six letters. Another purpose of writing was to predict the future, (Divination) All ancient societies tried hard to find ways of doing this. Even today we have horoscopes in our newspapers! 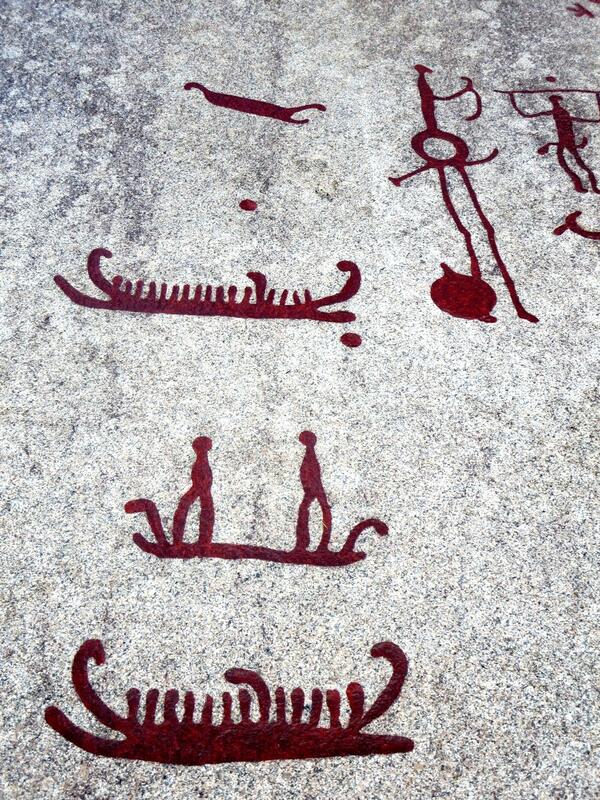 Rock Art (an example of spirit boat petroglyphs from Tanumshede, Sweden, appears on the far right) can also be seen as an early form of writing and communication. 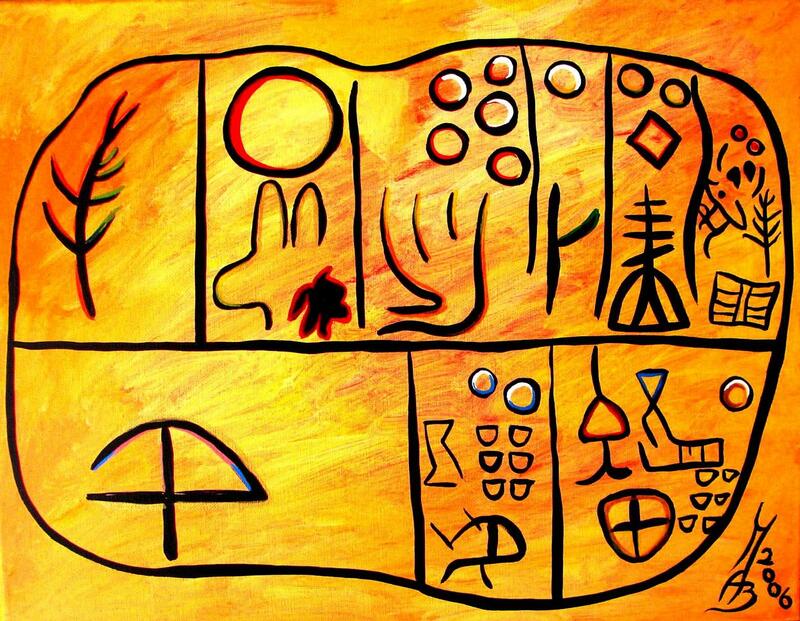 This painting shows a clay tablet that represents a trade agreement. In ancient Sumerian the word for reed 'ghi' also happened to mean 'reimbursement' .The picture of a reed (top left in the painting) therefore came to stand for 'reimbursement' for phonetic reasons. For many years I thought that most languages were phonetic (i.e. they record how the spoken word sounds) but that some scripts (like Chinese characters or Egyptian hieroglyphs) are based around pictograms. 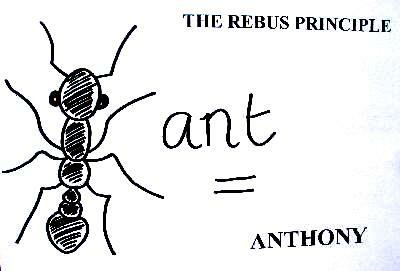 And although it is true that many hieroglyphs and characters do originate from pictures, they have long moved on to encompass what is known as The Rebus Principle, i.e. using images for phonetic value. Say you wanted to write the English word 'belief' in pictures. 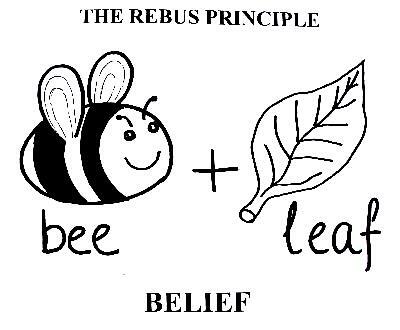 You could do a picture of a bee, followed by a picture of a leaf! 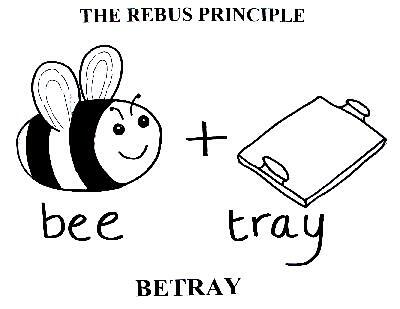 the word 'betray' could be written as 'bee + tray'. Or you could do something like just 'Ant' for Anthony. You find a lot of those kinds of abbreviations (bearing in mind this is an English equivalent to illustrate the principle) in Egyptian hieroglyphs. Signs that express emotions are particularly fascinating: they all have a component that gives a clue to the meaning of the whole character. This component is called the heart radical. Radicals are used when it comes to grouping characters and finding them in dictionaries. 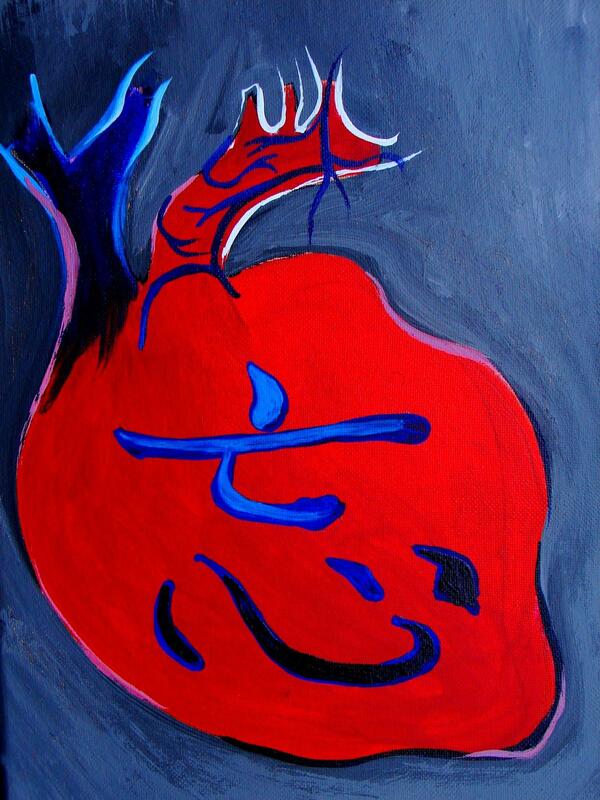 The characters that describe emotions all have the character for 'heart' as a radical! 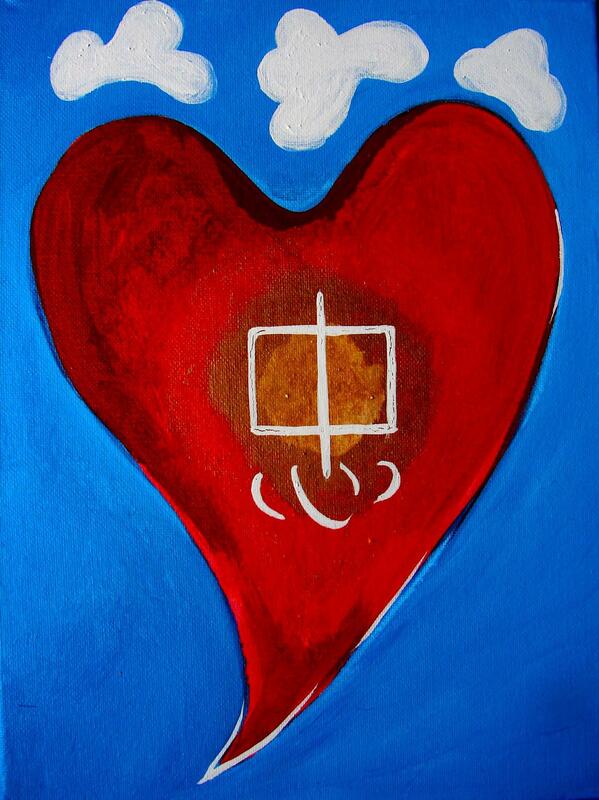 Can you spot the heart radical in the paintings below?! 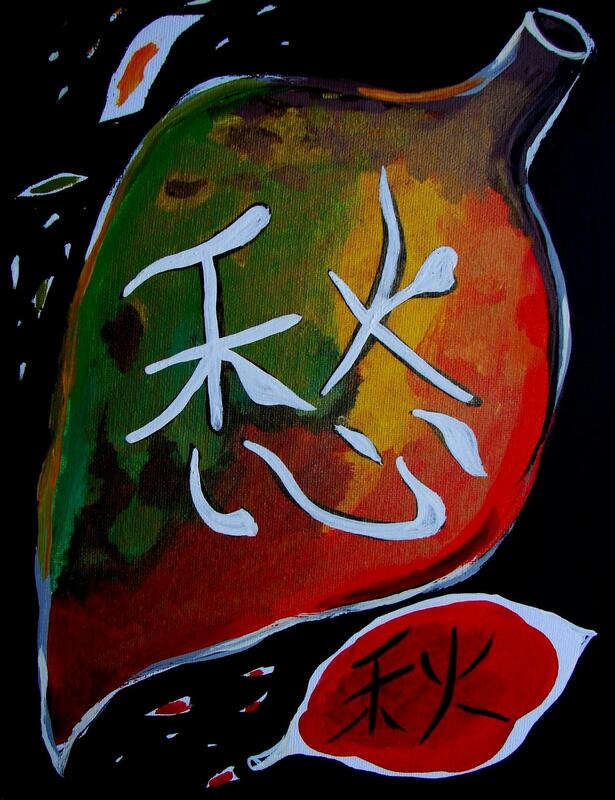 This Chinese character consists of the character for 'to die' (top bit) combined with the 'heart radical'. The Chinese character for 'melancholy, sadness, sorrow' consists of the heart radical and the character for 'autumn' (literally: time of the crop fires). In other words: melancholy is 'autumn in the heart'! 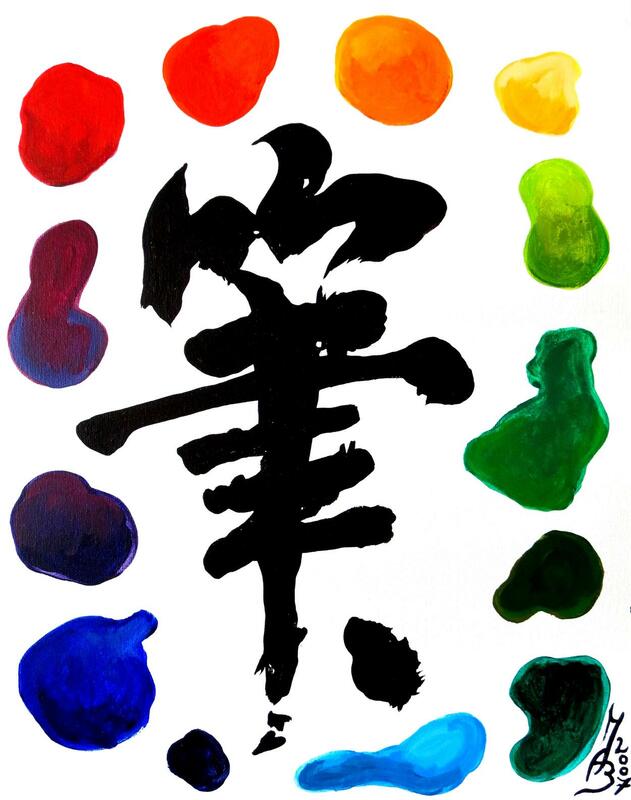 The Chinese character for thoughts consists of the character for the heart or feelings and the character for brain. This makes thoughts 'feelings on the brain'! The first character means "for a particular person, occasion, or purpose". 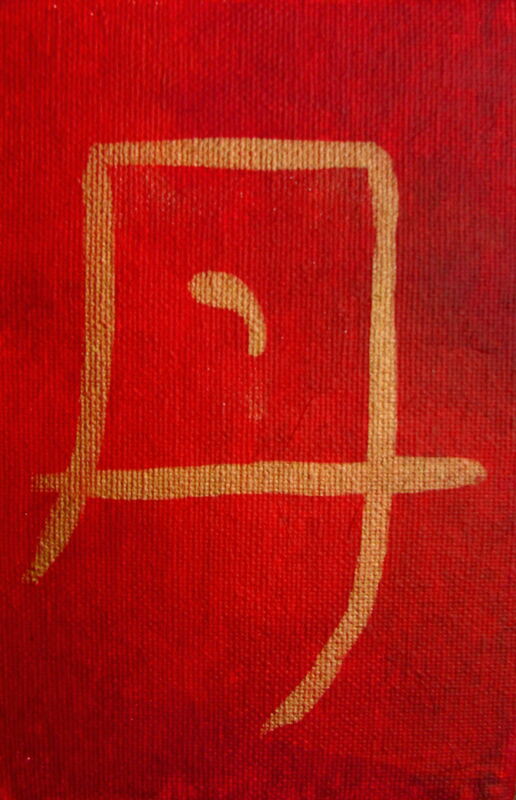 The second character means "heart" or "mind" by itself. Together, these two characters make a word that means, "paying attention with your heart." 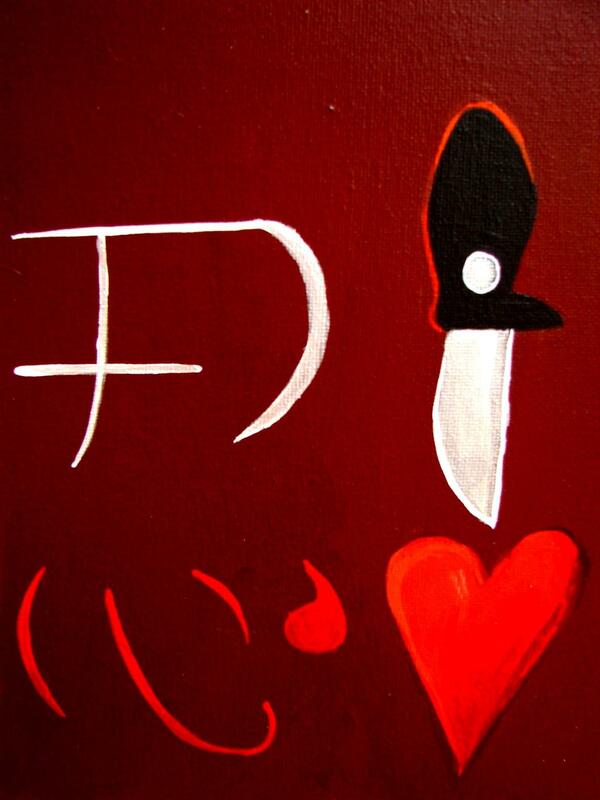 It's often translated as, "dedication,"
This character consists for the character for knife or blade at the top and once again the heart radical at the bottom. 'A blade in the heart' means 'to endure'! 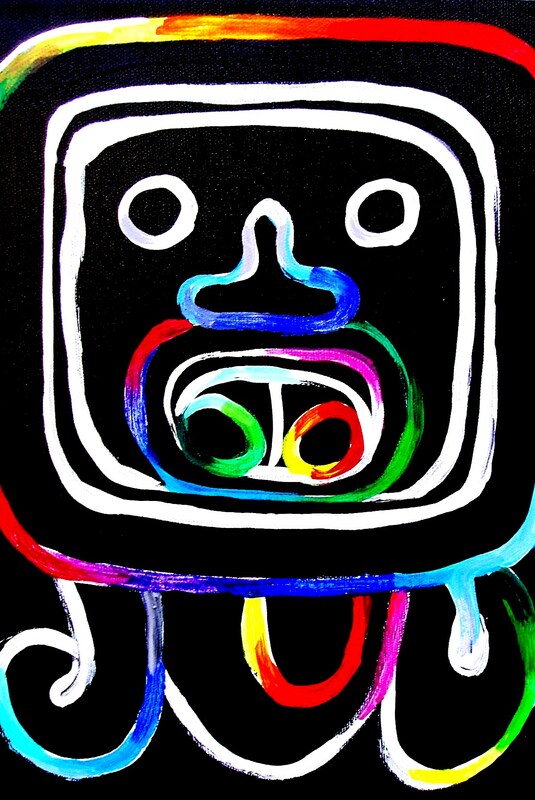 This painting shows my interpretatoin of the energy of this character! 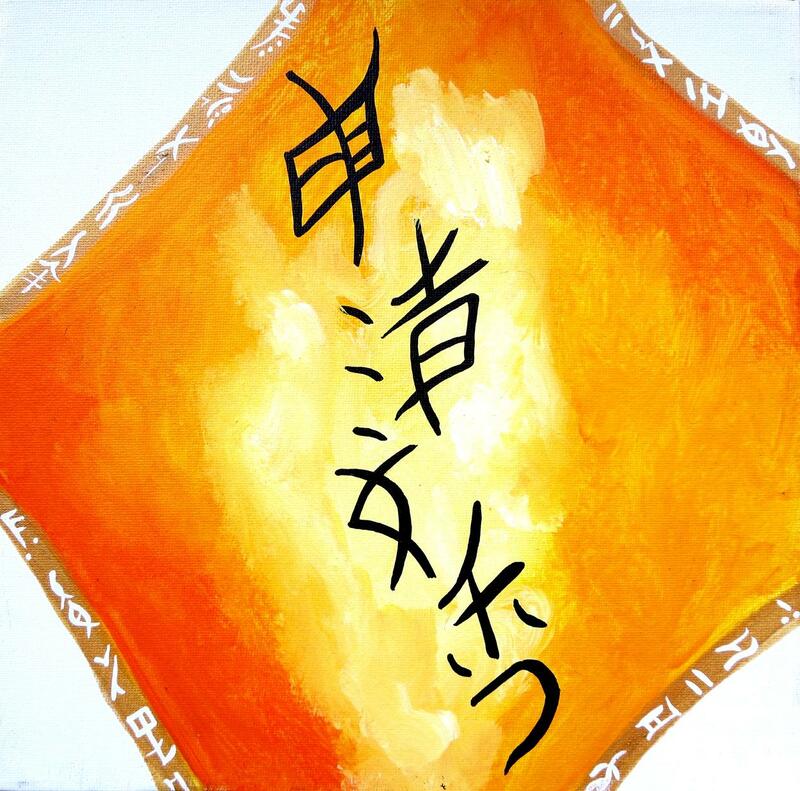 "that which hangs on the heart..."
Why don't Japanese people write everything in Kana? Because of homophony, i.e. words that sound identical (like 'to', 'two' and 'too' in English) and can only be identified by context. Homophony occurs on a large scale in Japanese and is therefore a big barrier to kana-only writing. For many centuries kana was the main style of writing used by women. Today Japanese Braille is written in kana. The result is that the Japanese blind are able to read more easily than many of the Japanese sighted! (Obviously there would also be a tremendous loss in cultural and historic terms if they really decided to switch to kana-only writing). I have been fascinated by language for as long as I can remember. 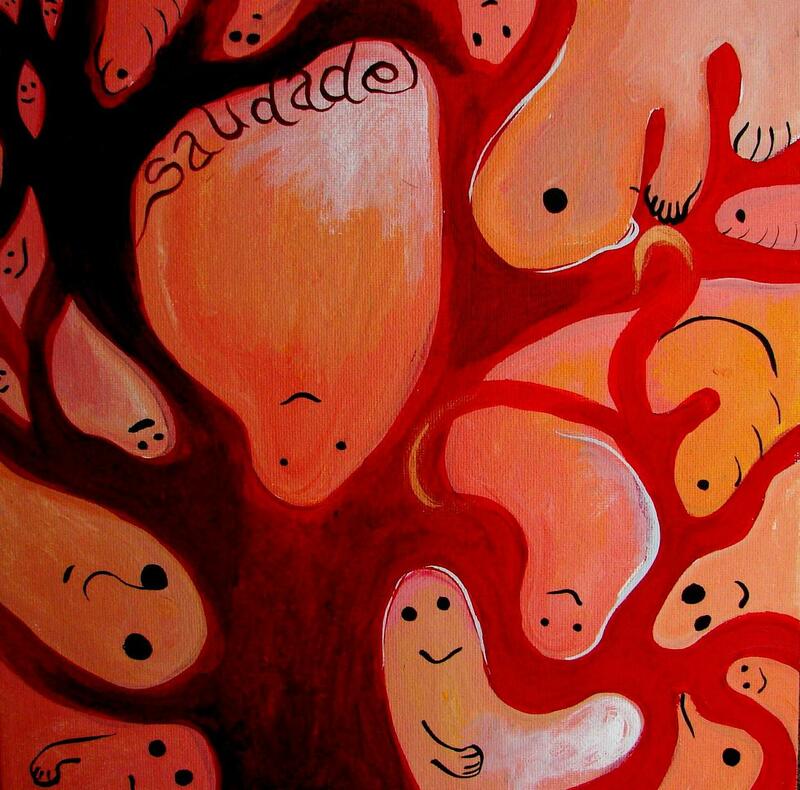 While at Art School I wrote an essay on the development of art and language in small children. In the process of researching that I became aware of how language is not a neutral thing. How language is like a pair of glasses in a way: without them you don't see much, but they shape and colour your view of the world. As we teach children to speak, we teach them about the world. We teach them what to notice, how to describe things, what to ignore, how to interpret the world. 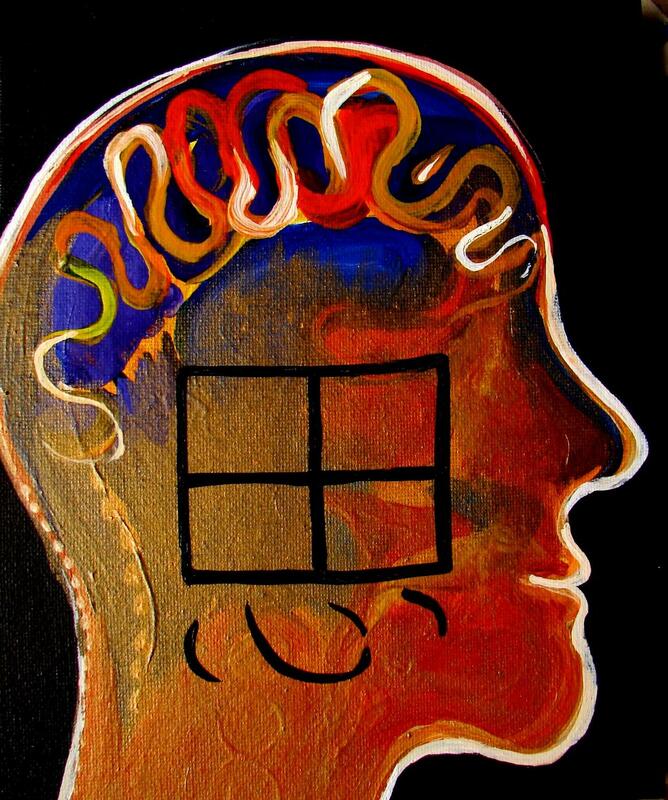 Basically when we teach children language we wire their brain! 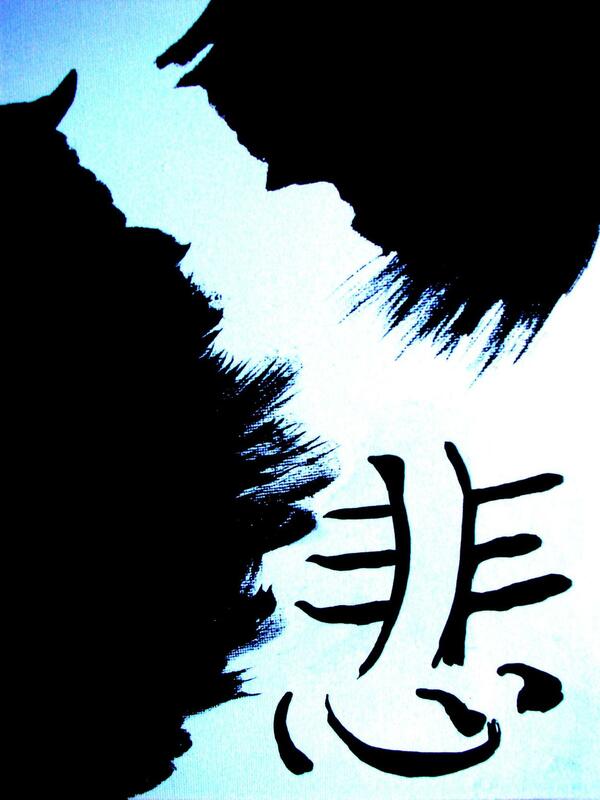 THE CHINESE CHARACTER FOR "BRUSH" LOOKS LIKE A BRUSH! Naxi is pronounced 'nah-shee' and also known as Moso. It's spoken in southern China (near Tibet. It is one of the few pictographic systems still in use in the 21st century. The script is used for recording ancient stories which are read aloud by dongba (priests). The system is not used for communication or record-keeping. 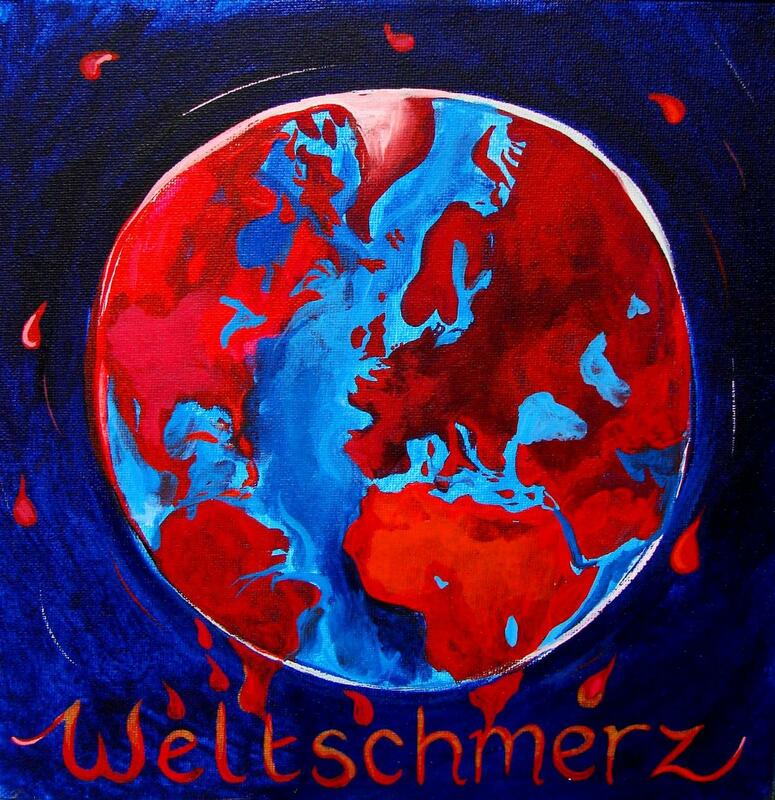 This painting shows an excerpt from the 'Song of the Dead, Relating the Origin of Bitterness'. The animals in the pictograms are yaks and stags. Yi, also known as Lolo, is spoken in Southern China near Tibet. The Yi script is probably a thousand years old. It was used traditionally by priests and practitioners of various forms of magic. 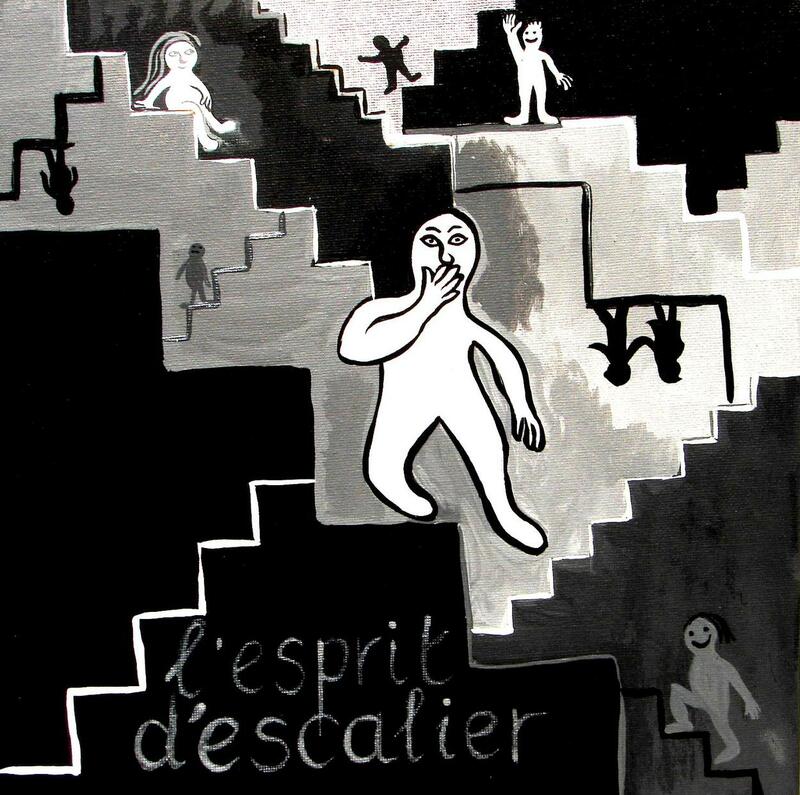 The characters generally represent syllables and number in their thousands. It is a syllabic script, i.e. 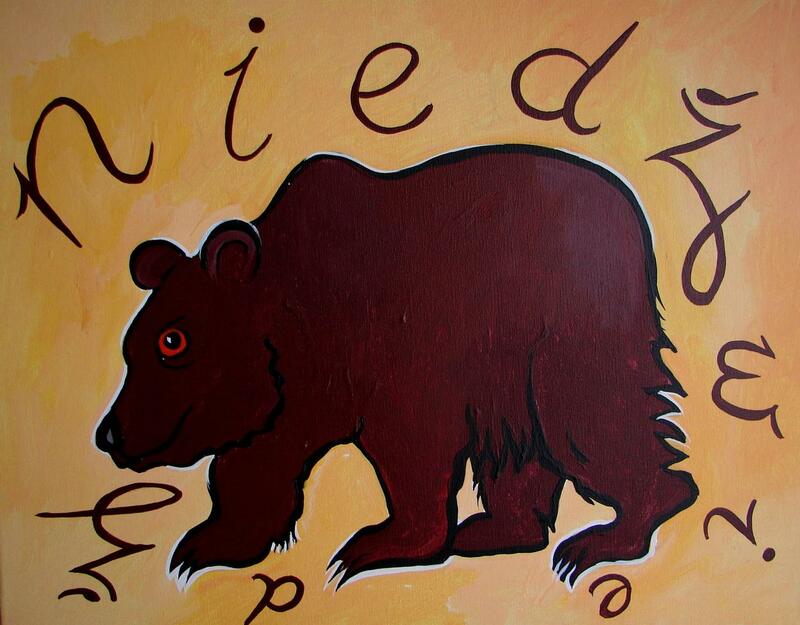 every sign represents a syllable consisting of a cluster of letters. 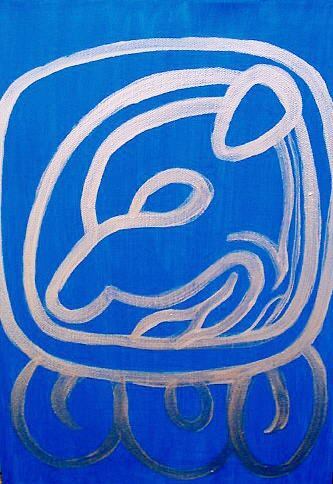 The Inuit (Eskimos) believe that just as there are pathways for hunting, there are pathways of the mind. Some paths lead to knowledge and others lead to chaos. Learning language is about learning 'pathways', A point to remember is that building a road also means creating areas where you don't go, areas that remain mysterious and inaccessible! 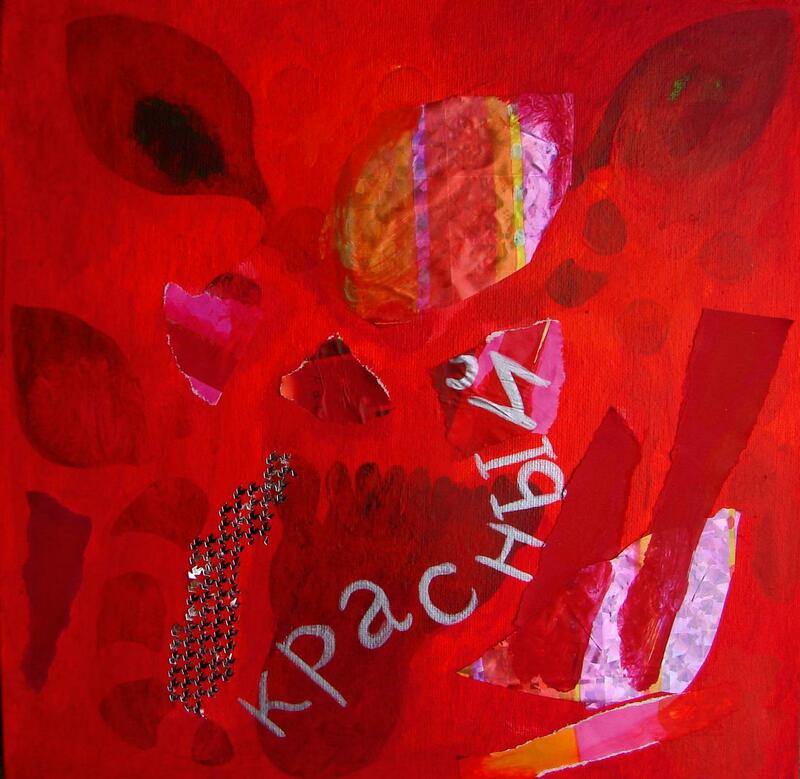 < In Russian the word for 'red' (krassniya) also means 'beautiful'! Hebrew is one of the world's oldest languages, spoken and written today more or less as it was 2000 years ago. It ceased to exist as a spoken language around 250 years BC but was reborn in the 19th century as a modern language, very much due to the efforts of one very determined man: Eliezer ben Yehudah. (This is mind-boggling: compare it to all of us deciding to speak Latin to each other from now on!) It is the principal language of the state of Israel today. The alphabet is written from the left to the right without vowels. (E.g. 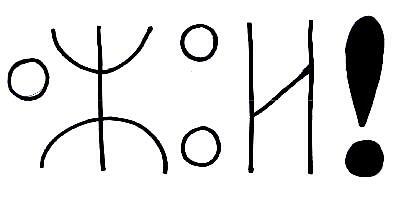 the word for 'dog', kelev, appears as 'vlk'). This means that if you are not familiar with the language, you can't pronounce the words as you won't know what vowels to insert! 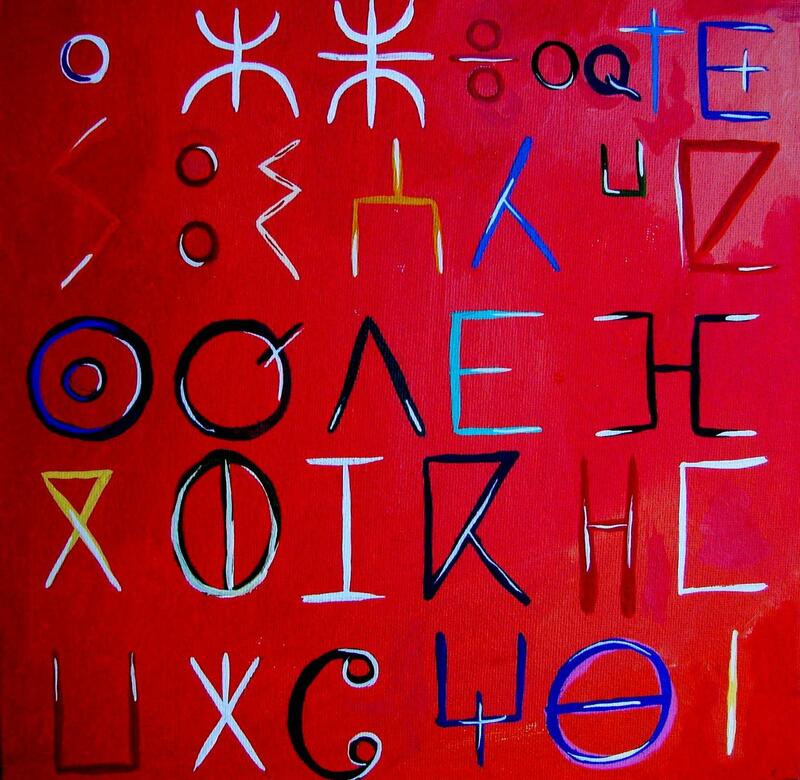 This painting shows the Tiginagh script which is still in use among the Tuareg people. 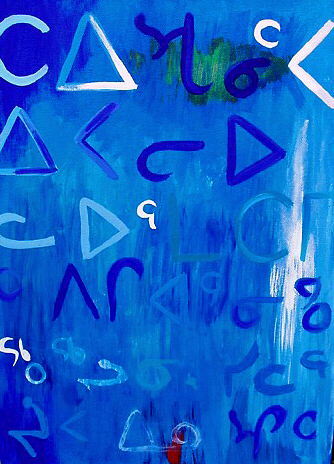 The word 'Tifinagh' is the plural of the word 'tafineq', which means letter and is a berberization of the Latin world 'punica'. 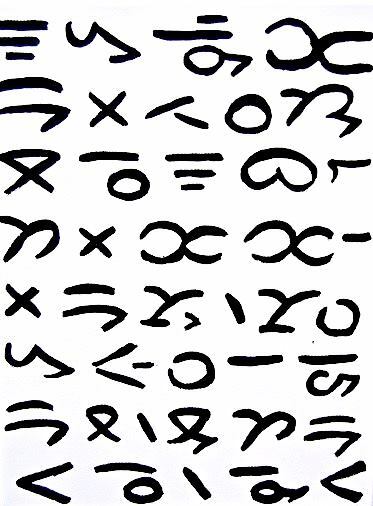 Tifinagh is a consonantal script, written from right to left. 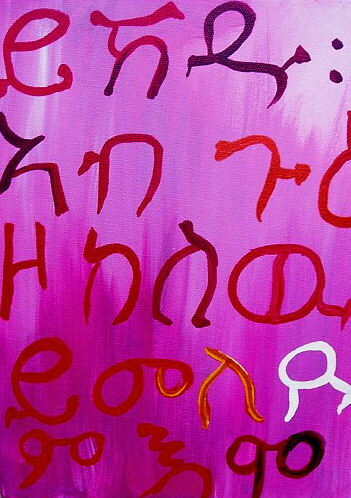 Like Hebrew it is essentially a vowel-less script, though the dot called the 'tagherit' (top left in canvass above) can be used to indicate an a,i or u at the end of a word (only). There is a system of dots and dashes (diacritical signs) to be placed above and below the consonants. In real life those are confined to school books, prayer books and textbooks for foreigners! You won't find them in newspapers or everyday books. 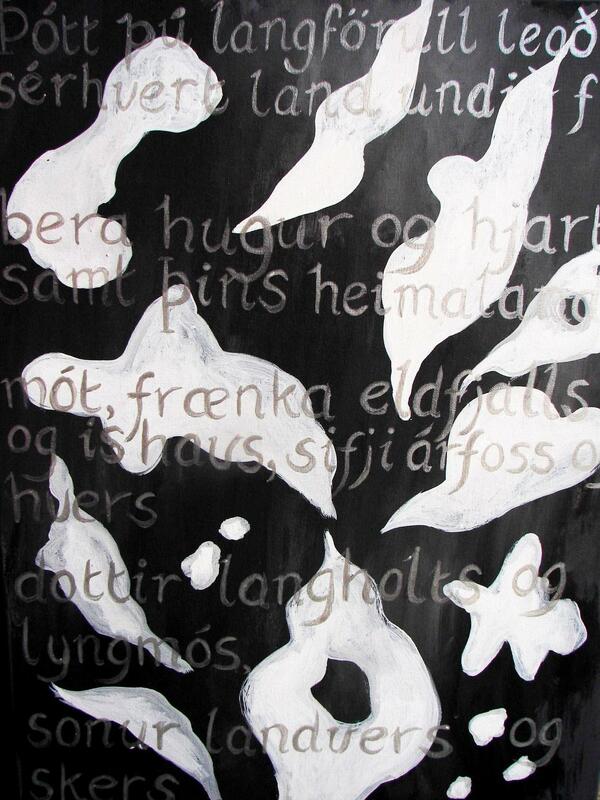 Icelandic and Faroese are the closest living relatives to Old Norse, the language the Vikings spoke. The Icelandic people go to great lengths in preserving the beauty of their language: they even have a special committee that invents words for the 21st century! By way of example: the Icelandic word for 'telephone' is 'simi', which is an old Icelandic word for 'thread' or 'wire'. The word for 'electricity' is, rather poetically, 'rafmagn' or 'amber power'.The word for computer is 'toelva'. 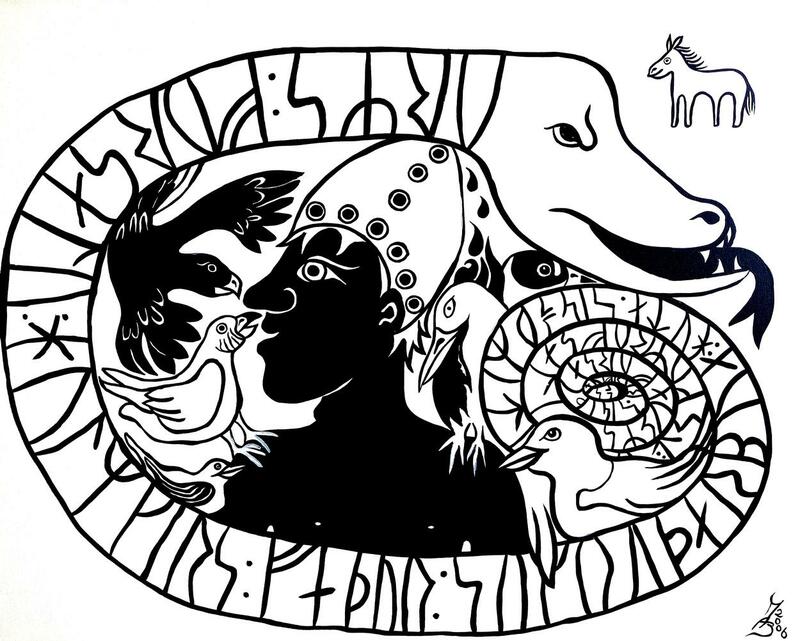 It is composed from an ancient word for 'prophetess (volva)' combined with the word for 'digit'. Hobos are people of no fixed abode who turn to the road to try their luck elsewhere. They arrived at a complex series of markings and drawings to communicate with fellow travelers about houses where kind people live, who to avoid etc. etc. 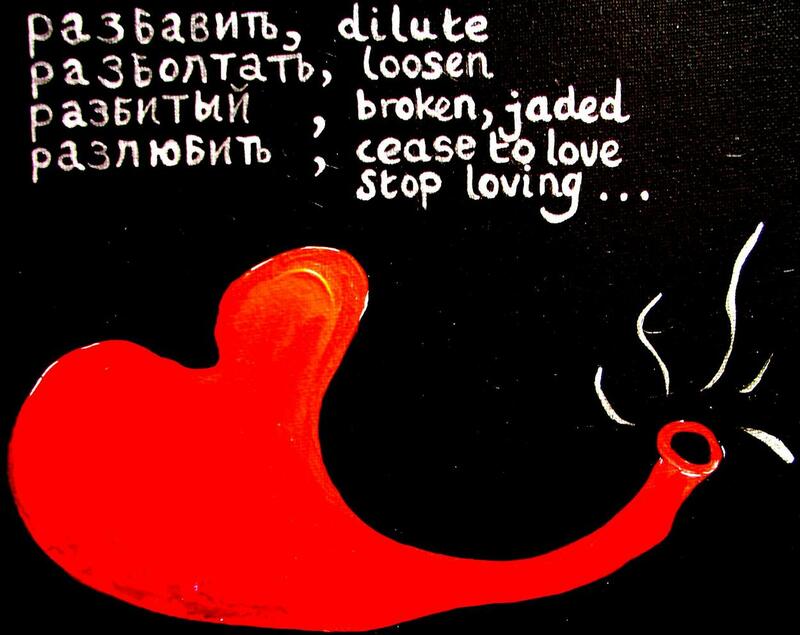 In English we have the concept of Unconditional Love. 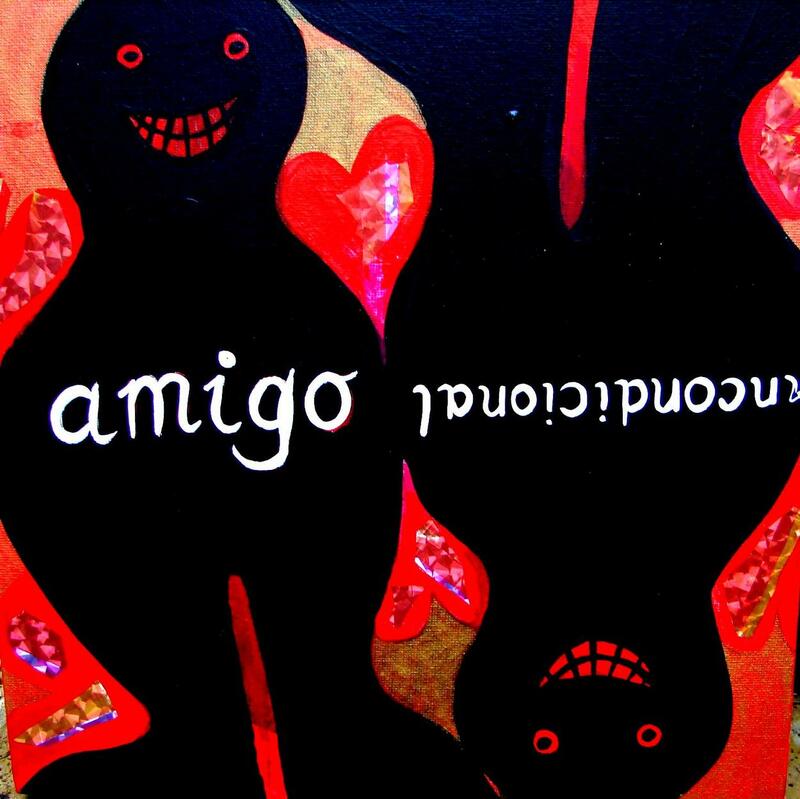 In Spanish there is the concept of the Unconditional Friend or Friend for Life. 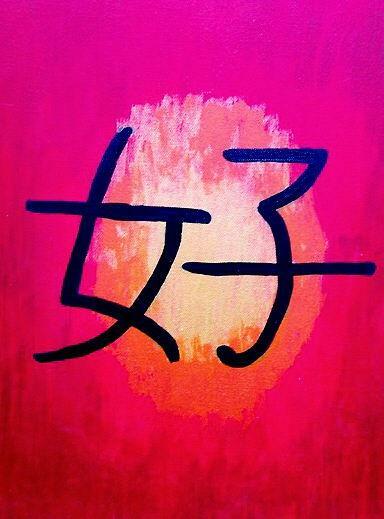 My friend Sony Baron calls this a Friend with capital letter F! In feudal China, women, usually with bound feet, were denied educational opportunities. 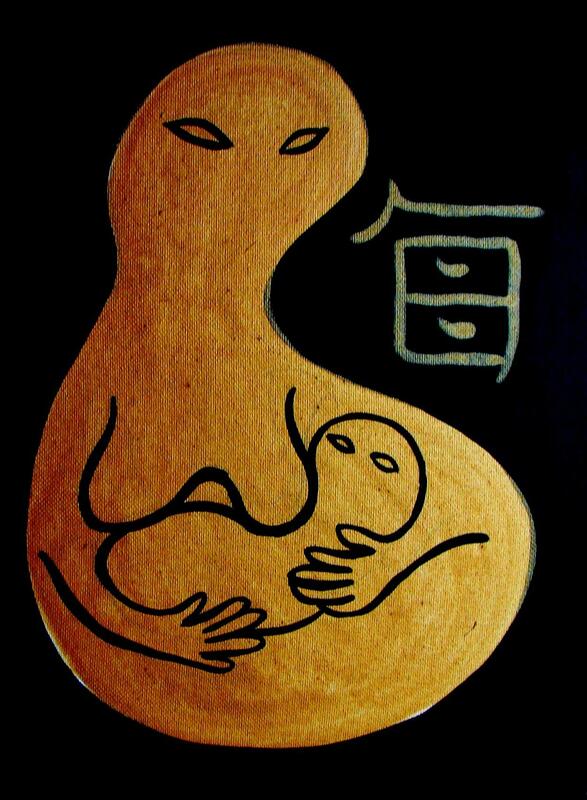 In Jian-yong county in Hunan province, peasant women developed a secret written language, called Nu Shu, meaning "female writing." to stay in touch with each other.